Free Shipping Included! Prohoe Field Hoes - 7'' wide blade - Cotton Hoe, Fiberglass Handle by Prohoe at Buy Online Guru. MPN: F70F. Hurry! Limited time offer. Offer valid only while supplies last. Having a tool that you can depend on to perform reliably is essential. Prohoe's F70F Fiberglass-handled Seven Inch Field Hoe is just such a tool. Prohoe's F70F Fiberglass-handled Seven Inch Field Hoe is just such a tool. Individually hand crafted right here in the USA, the tool "head" is custom created from recycled agricultural disc blades--a high grade tempered steel that is strong and has a great ability to hold an edge, so you don't have to waste time sharpening your tools. Use this tool for breaking up sod, cultivating crops, and digging irrigation ditches too! It is large enough to use on a corn row, and narrow enough for more delicate garden plants as well. 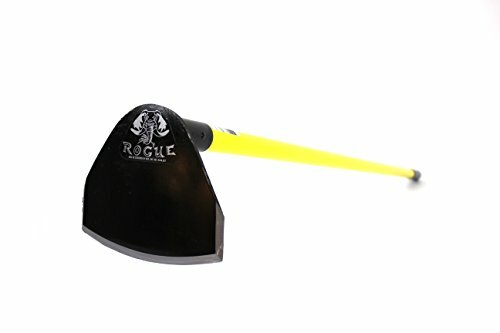 Rogue tools will make your job easier and we guarantee that you will not need a new head for your lifetime or we will replace it at no cost to you. ***DIRT DIGGING MACHINE*** This thick 7 inch wide tempered steel field hoe packs a wallop, capable of easily busting open new ground, cultivating crops, or using it in any garden application. All three sides are precision sharpened so is makes easy work for you and takes less time. ***HEAVY DUTY, YET BALANCED*** This Heavy Duty Field Hoe can handle any task you have in preparing, working, or cultivating your garden. It feels extremely well balanced in your hand, and with the extra-long 60" Fiberglass handle you have more work torque. This means less exertion on your part the hoe does the work for you! *** CUTS FROM ANY ANGLE*** Unique shape and ultra-sharp sides allow you the ability to use this tool for breaking up sod, cultivating crops, and digging irrigation ditches too! It is large enough to use on a corn row, and narrow enough for more delicate garden plants as well.